When registering as a subscriber, you must provide us with accurate, complete and up-to-date information, as requested. We may at any time request a form of identification to verify your identity. It is your responsibility to inform us of any changes to your subscription details. If you wish to change any of your subscription details, you will need to contact Customer Service on 1300 884 434. To have your subscription redirected to a new address, you must give us at least 10 business days' notice. It is your responsibility to provide valid payment details. 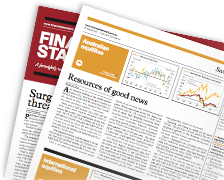 Financial Standard will process your digital subscription purchase as promptly as possible. Please allow 14 days for delivery of the paper to commence. You should consult your accountant about your eligibility to claim your subscription as a tax deduction. The costs of all subscription are made clear during the order process. You agree to pay the cost stated at the time of your order. All costs are in Australian Dollars (AUD). Financial Standard reserves the right to change subscription costs at any time. We will provide you with written notice if the cost of a subscription changes from the specified cost at the time of your order. Any changes to your standard subscription cost will take effect at the time of your subscription renewal. - No refund is provided if the amount to be refunded is less than $10.00. b. Financial Standard reserves the right to suspend or cancel your subscription at any time in its absolute discretion. In the event that Financial Standard cancels your subscription, you will receive a pro-rata refund for the balance of the term on your Upfront Subscription. Unless otherwise provided for in these Terms and Conditions, all charges billed are non-refundable. Financial Standard reserves the right to modify the content, inclusions, features and structure of any digital product at any time. In the event your subscription package will be affected by a change, you will be given 14 days' prior notice of the change. Financial Standard does not guarantee that our digital products will be available without interruption at all times. In the event of a problem or interruption, Financial Standard will endeavour to restore the full availability of our affected products. Financial Standard is not liable for any loss or damage that may arise as a result of any error by you or incorrect information supplied by you. It is your responsibility to provide valid payment details. Financial Standard will process your event registration as promptly as possible. You should consult your accountant about your eligibility to claim your event registration as a tax deduction. The costs of all event registrations are made clear during the order process. You agree to pay the cost stated at the time of your order. All costs are in Australian Dollars (AUD). Financial Standard reserves the right to change event registration costs at any time. You must call or email Financial Standard Client Services to cancel your event registration at least 14 days before the event date. No refund within 14 days of the event, however name changes are permitted. Financial Standard reserves the right to suspend or cancel your event registration at any time in its absolute discretion. In the event that Financial Standard cancels your registration, you will receive a full refund. Changes to attendee names are permitted. Please contact us with changes to attendee names.